As part of the exhibition OUR SHADOW CODEX, Toby Paterson and Rhona Warwick programmed a series of performances, screenings and talks. These events were a curatorial strategy to reconfigure the archive and reading of the city. 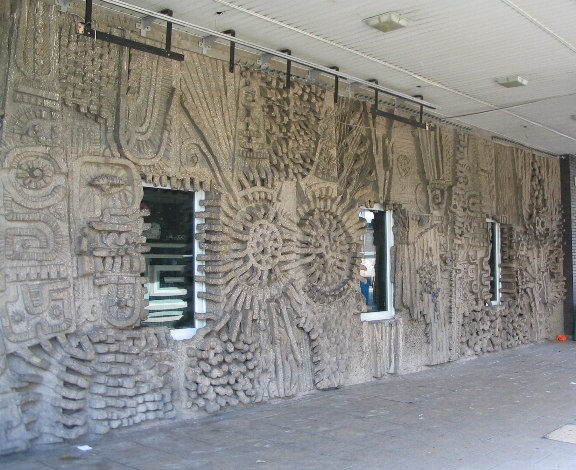 Bill Mitchell designed Coventry’s 1966 Three Tuns Mural at a time when the City Architecture and Planning Office, led by the architects Donald Gibson and Arthur Ling, commissioned an ambitious programme of public art for the city. The Three Tuns Mural is an abstract concrete high relief incorporating Coventry’s industrial heritage and built environment. Integrated public art was a widespread device of post-war planning and Coventry’s collection is a strong example of this. Mitchell (b.1925) has had an extensive 50 year career as an artist, civic planner and sculptor and experienced the changing political climate of urban planning, beginning in the experimental civic period of the fifties and sixties. Bill will present an illustrated lecture, detailing his work and techniques and its relationship to the history of planning policy, public art and architecture.